The Vancouver Condo Buzz » From Mid-$200’s > The Anchor North Vancouver Condos in Lower Lonsdale – Only 61 Boutique North Shore View Apartments for Sale! « From $474,900 > Boutique Vancouver Westside Condos at The Vermeer Kitsilano Now Selling! Only 13 Available! From Mid-$200’s > The Anchor North Vancouver Condos in Lower Lonsdale – Only 61 Boutique North Shore View Apartments for Sale! A boutique condo community by the sea… coming soon to the exclusive Lower Lonsdale North Vancouver real estate neighbourhood. Water views and city lights. Sea air and concrete construction. This is The Anchor North Vancouver condos, a boutique Lower Lonsdale condo community grounded in a walkable neighbourhood full of shops, boutiques, cafes and restaurants. Just 12 minutes from downtown Vancouver via the SeaBus and steps away from the Lower Lonsdale Waterfront Park, The Pier and Spirit Trail, let your adventure begin at The Anchor North Vancouver condos for sale. Fresh local produce at the Lonsdale Quay and a cosmopolitan dining scene stretching for blocks outside your door is now right here at the boutique Lower Lonsdale North Vancouver Anchor condos. 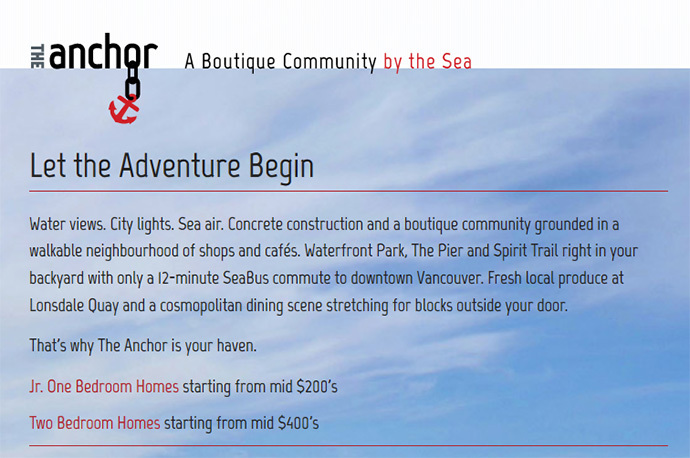 That why The Anchor condos in North Vancouver is your haven. The project site location is at 131 East 3rd Street North Vancouver and they are brought to you by Kamcon Construction and BT Investments Ltd. Located in the heart of vibrant Lower Lonsdale neighbourhood, The Anchor North Shore condos introduces just 61 boutique apartments that range from junior one bedrooms (studios) to spacious 3 bedroom homes. The pricing starts from the mid $200,000, making them very affordable for this vibrant community and this 7 storey boutique mid rise building will feature concrete construction, luxury finishing, a roof top patio/deck with views across the Vancouver skyline and harbour. As well, residents at The Anchor North Vancouver condos will have easy access to the Lonsdale Quay market in addition to cosmopolitan dining and the Seabus which will take you to downtown Vancouver within 12 minutes. More information about this project is now online at www.theanchorliving.com. You can register for VIP information and preview launch details coming this summer! Concrete Construction – that provides durability, quiet enjoyment, and long-term protection of the value of your home and investment. Spectacular Views – of Vancouver City Harbour, Lions Gate Bridge, The Lions and our local mountains. Exceptional Location – in the heart of the North Shore’s Lower Lonsdale community, close to diverse dining and shopping options, and only a quick ride to downtown Vancouver or up to your favorite mountain trail. Luxury Finishes – that will impress you and your guests at every turn. From top-end kitchen appliances featuring premium gas ranges to bring out your inner chef, to European bathroom fixtures that will pamper you from head to toe right here at The Anchor North Vancouver. Best of all, The Anchor North Shore condos has several plans from which to choose, ranging from Junior Ones to luxurious Three Bedroom homes, so we’re pretty confident you’ll be able to find one that’s ideal for you. 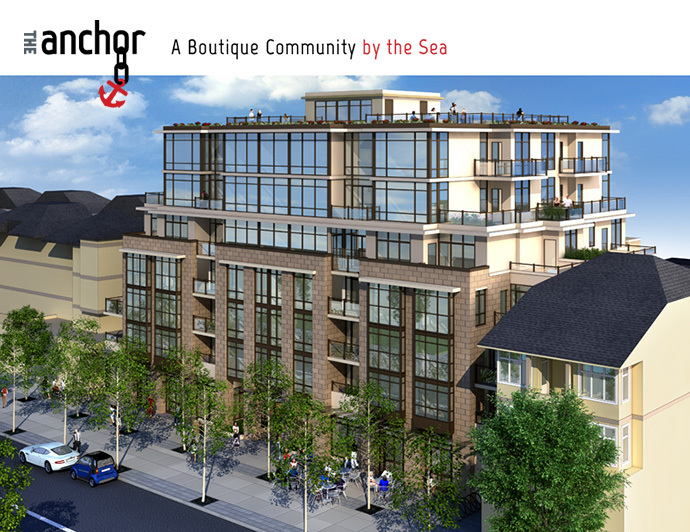 The Anchor Presentation Centre will be on-site and is scheduled to open in late Summer 2013. 131 East 3rd, North Vancouver, BC. You can also find out more online at www.theanchorliving.com.